Foreign Exchange or Forex (FX) is a Perfect market place for a Lazy, Retired, Hopeless, person like U & ME, but seriously eager inside to make money Genuinely & Instantly, which i know. If you don’t need money, please close this browser right now. So, this www.fxtimes.wordpress.com is a simply quick, easy & reliable educational information for naive beginners, experts to predict market in advance. Your little or basic Computer knowledge, skills, little money is enough to start and master on FX trade. Do not forget every words pointed out in this course. Learn face to face is the best and quickest way. Soon U will realize the Greatest enemies are your FEAR, GREED & HOPE; UR best friend will be PATIENCE & EXPERIENCE, because MONEY is going nowhere else, believe me. You should teach your kids. FX is an largest instant market platform, 24Hr online trading system globally that ever to TAKE PROFIT (TP) in this volatile currency exchanges rates (between two currencies), future Metals ( Gold[Au], Silver[Ag], Copper[Cu], etc..), Future Commodities (Crude Oil, Natural Gas etc..) due to demand & supply. KNOW Best in FX – No need to search Customers, Sit in Home Comfortably to trade, instant trade, Opens 24Hr & 5 days a week (Monday-Friday) running, High Leverage & market Liquidity, Market Price-Predictable, Repeating Market Pattern/history Fluctuating/Volatile, Take Profit (TP) either market is going down or up trend, trade with whatever money you have with (Also you need backup money for Margin Call in case of Loss trending), Demo version is available for practice on online real trade, Risk is here and its management is also here. -TP in all market situation (no matter up/down trend). (Profit Opportunities everywhere, every time).Remember, You can do Sell First when price is on high, and wait to buy, when market price goes down to TP positively. – At least overall 70 % monthly transaction should be on TP, 30% loss with Stop Loss (SL) system. Also in each transaction, your TP should be at least 3 times greater than SL. It is means achieving our Goal, ie. TP ONLY. Time – A week long for Basic course only- 2 HRs everyday. If you have no mentors, practice for 6 months on DEMO. With a direct mentor-ship/supervision of a good broker or experts, you can immediately start trading, which is also good because he/she will reminds you where, when, how, which, to trade carefully. Real Trading will keeps your all senses open because If you lose, you will lose real money; similarly you will gain a real money immediately. Financial Trade & Analysis – Broker ­- You need some good broker to trade. (A good broker gives you the best possible suggestion). Open an account with online banking with Third party transfer facility recommended by your broker or have availability with bank service for Forex trade.Learn Technical Analysis skills to follow http://www.fxtimes.wordpress.com or http://www.babypips.com; http://www.forexfactory.com for Fundamental analysis- Country NEWS also affects markets trend. Another your Sentimental Analysis plays usually while trading from your experience, Fear, Greed, Hope. In Technical analysis, you should learn Candlesticks, Chart Trends, Indicators to predict market in advance. Software – Download FX Pro Meta Client Terminal 4/5 from http://www.fxpro.co.uk for trading purpose or learning. M1 M5 M15 M 30 1H 4H 1D 1W 1M – Periodicity for market in Minutes (M), Hours (H), Daily (D), Monthly(M) display. Market Watch: Left Pane- Display Market products like Currency Ex, Commodities, Futures Market. Market Display: As shown in above figure with a Black Color Background that shows a real market. 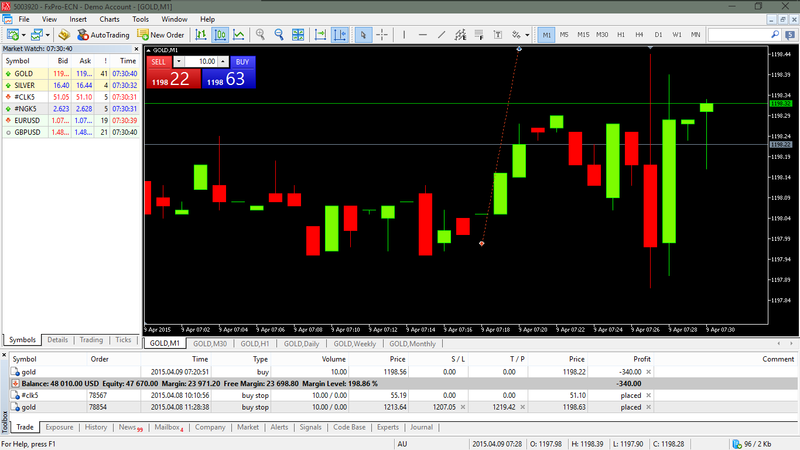 Toolbar: Below Pane display your Transaction details, Market display in numbers, Profit/Loss, etc…. Trading Strategy 1: Learn Basics to become an Expert: First Learn on Handling Trading Software, Understand Trend/Chart Patterns and Indicators under this Technical part.